Posted By:Unknown | At:10:02 PM Be the first to comment! 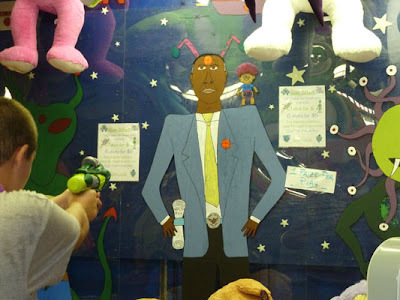 ALLENTOWN, Pa. — The head of an eastern Pennsylvania amusement company has yanked a carnival game in which players shot foam darts at an image resembling President Barack Obama. Irvin Good Jr. pulled the target-shooting game after receiving a complaint from a Massachusetts woman attending a fair in Roseto, about 65 miles north of Philadelphia. Good said Wednesday his company, Hellertown-based Goodtime Amusements, won't offer the game again. "It was just a big, big mistake in judgment, and I feel sorry about it," he told The Associated Press. "I can't take it back, but I can try to make it better." The game, dubbed "Alien Attack," featured a large painted image of a black man wearing a belt buckle with the presidential seal and holding a scroll labeled "Health Bill." Players could win prizes such as stuffed animals by hitting targets on the image's head and heart. The game was featured in late July at the Our Lady of Mount Carmel Big Time Celebration, an annual fair that raises money for the Roman Catholic parish in Roseto. Kathryn Chapman, 55, of Medford, Mass., who spent part of her childhood in Roseto and was in town for a family reunion, spotted the game and complained to Good. "What is the message you are sending kids, that if your views don't agree with somebody else's, shoot them? I just found it incredibly disrespectful and violent," Chapman said Wednesday. "And this was the president, the highest office in the country. It was absolutely appalling." Good said that he voted for Obama and that the game wasn't meant to encourage violence against the president. He said the image was conceived and painted by a staffer. "He just drew it up, and that's the way it came out," Good said. "We didn't talk about it being political." Good said he has not been contacted by anyone in law enforcement regarding the game. Goodtime Amusements has been in business for 26 years, operating carnival-themed fundraisers throughout the Allentown region. The Obama-themed game had been running since April. Good said he had received one other complaint about it before Chapman's. The controversy over the game was first reported by The Express-Times of Easton.